September 15, 2009 -- Bill Cooney writing -- Follow-up to my last message: Per Chiefie's 1957 tent group list, this tent group picture should be captioned "Tent 17, 1957" and the counselor is listed there as W. Danner. (I note on Chiefie's list there's a B. Danner as the counselor in Tent 18.) No Loomis. 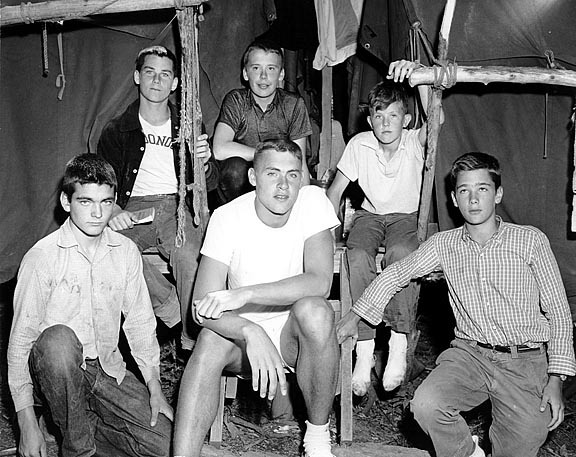 August 28, 2009 -- Bill Cooney writing -- Regarding the tent group photo here (link removed by Nightman - moot), this was from 1956 or 1957 and I was the camper in the center, behind the counselor, whose name escapes. Charles McManus is on my right and Walter is at the far right of the photo. I think the camper on the left in front was named Loomis, but I can't come up with his first name. Great site. Thank you so much. December 15, 2002 -- John Mercer writing -- Lower right is another McManus; is that Walter? I'm going to remember the kid on the upper right and the one on the lower left, but it's going to take a while. December 15, 2002 -- Mac Mellor writing -- Charlie McManus in back row at left? Note McDonough tee shirt. Top row: Charlie McManus, Bill Cooney, ? Hansen. Bottom row: D. Rogers, W. Daner, Walter McManus.